Samsung's Galaxy Tab: Price Tag, Please? Samsung forgot to mention one crucial detail about is upcoming Galaxy Tab tablet: the price. The Galaxy Tab will come on all four major U.S. wireless carriers later this year, but Samsung is still keeping mum over how much you will have to shell out for one its latest tablets. But we have a hint. A listing for the tablet on Amazon's U.K. site is setting some worrisome prospects. According to the listing, you can get a 16GB Samsung Galaxy Tab the equivalent of $1067, and that's with a 15 percent discount. 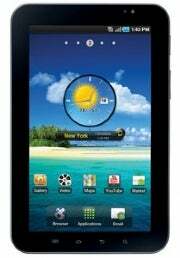 Is Samsung setting up the Galaxy Tab for instant failure due to high pricing? At this sort of price point, the tablet will presumably come without any contract commitment to any carriers (so you would be able to theoretically use it in the U.S. with an AT&T or T-Mobile SIM card). The Amazon ad doesn't say. Since Samsung announced it will sell the Galaxy Tab through AT&T, Verizon, Sprint, and T-Mobile in the U.S., it is possible you won't be able to buy an unlocked Tab straight away. Samsung said that later this year it will also launch a WiFi-only version of the device, which won't be tied to any wireless carrier. It will be interesting to see what price points Samsung and the carriers agree upon for the Galaxy Tab, especially as the U.S. version of the tablet won't have phone capabilities (via Bluetooth and speakerphone) like the European model. You will still probably need to sign up to a two-year contract with a carrier to get a Tab, so if the device itself is pricey, then this would put off potential buyers. In comparison, an Apple iPad with WiFi and 3G starts at $629, and you don't need an AT&T contract. You can pay-as-you-go on a rolling monthly basis, starting from $15. If you don't need 3G one month, you can cancel at any time without any penalties; while if you need more than 250MB, you can always go up to $25 for 2GB of data. If the Samsung Galaxy Tab comes tied with a contract, depending on the initial cost and the monthly price plan, the total ownership costs could easily be twice as expensive as owning a 3G iPad. So when will the Galaxy Tab be up for grabs? Again, Samsung only said it will arrive "in the coming months." But if the Amazon listing is any indication of the shipping date, the tablet should appear sometime in October or November. Until then, stay tuned for updates on pricing and plans for each carrier.